(1) This Act may be called The Foreigners Act, 1946 . (2) It extends to the whole of [India]. Statement of Objects and Reasons.-At present the only permanent measures governing foreigners specifically are the Registration of Foreigners Act of 1939 and the Foreigners Act, 1864. 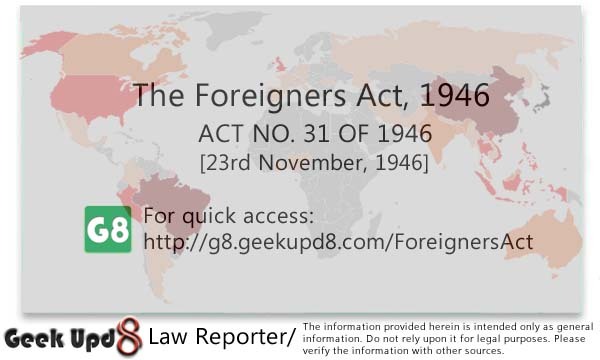 The Act of 1939 provides for the making of rules to regulate registration of foreigners and formalities connected therewith, their movement in, or departure from, India. The Act of 1864 provides for the expulsion of foreigners and their apprehension and detention pending removal and for a ban on their entry into India after removal; the rest of the Act which provides for report on arrival, travel under a license and certain incidental measures can be enforced only on the declaration of an emergency. The powers under this Act have been found to be ineffective and inadequate both during normal times and during an emergency. The needs of the war emergency were met by the enactment of a Foreigners Ordinance in 1939 and the promulgation under it of the Foreigners Order and the Enemy Foreigners Order. Even at that time the need for more satisfactory permanent legislation was recognised but it was decided to postpone consideration of such a measure until after the war. The Ordinance was, therefore, replaced by the Foreigners Act, 1940, the life of which was to expire on the 30th September, 1946, but has recently been extended by the Foreigners (Amendment) Ordinance, 1946, upto the 25th March, 1947. Meanwhile the question of permanent legislation, more or less on the lines of the Act of 1940 has been examined, in consultation with the Provincial Government. All Provincial Governments agree that such permanent legislation in repeal of the Act of 1864, is necessary. The Bill in the main reproduces the provisions of the Foreigners Act of 1940. Amendment Act 42 of 1962-Statement of Objects and Reasons.-In view of the present emergency, it is necessary that powers should be available to deal with any person not of Indian origin who was at birth a citizen or subject of any country at war with, or committing external aggression against, India or of any other country assisting the country at war with or committing such aggression against India but who may have subsequently acquired Indian citizenship in the same manner as a foreigner. It is also necessary to take powers to arrest and detain and confine these persons and the nationals of all such countries under the Foreigners Act, 1946, should such need arise. 2. Since the Parliament was not in session and immediate action had to be taken in the interest of national security an Ordinance called the Foreigners Law (Application and Amendment) Ordinance, 1962, was promulgated on 30th October, 1962, to take the above powers. The object of the Bill is to convert this Ordnance into an Act of the Parliament. (c) specified means specified by direction of a prescribed authority. 3. Power to make orders. (1) The Central Government may, by order make provision, either generally or with respect to all foreigners or with respect to any particular foreigner or any prescribed class or description of foreigner, for prohibiting, regulating or restricting the entry of foreigners into [India] , or their departure therefrom or their presence or continued presence therein. and may make provision [for any matter which is to be or may be prescribed and] for such incidental and supplementary matters as may, in the opinion of the Central Government, be expedient or necessary for giving effect to this Act. (b) any other individual foreigner or class or description of foreigner. (2) Any foreigner (hereinafter referred to as a person on parole) in respect of whom there is in force an order under clause (e) of sub-section (2) of section 3 requiring him to reside at a place set apart for the residence under supervision of a number of foreigners, shall while residing therein, be subject to such conditions as to maintenance, discipline and the punishment of offences and breaches of discipline as the Central Government may from time to time by order determine. (b) give an escaped internee or person on parole any assistance with intent thereby to prevent, hinder or interfere with the apprehension of the internee or the person on parole. (1) No foreigner who was in [India] on the date on which this Act came into force shall, while in [India] after that date, assume or use or purport to assume or use for any purpose any name other than that by which he was ordinarily known immediately before the said date. (2) Where, after the date on which this Act came into force, any foreigner carries on or purports to carry on (whether alone or in association with any other person) any trade or business under any name or style, other than that under which that trade or business was being carried on immediately before the said date, he shall, for the purposes of sub-section (1), be deemed to be using a name other than that by which he was ordinarily known immediately before the said date. (3) In relation to any foreigner who, not having been in [India] on the date on which this Act came into force, thereafter enters [India] , sub-sections (1) and (2) shall have effect as if for any reference in those sub-sections to the date on which this Act came into force there were substituted a reference to the date on which he first enters [India] thereafter. (b) a name shall be deemed to be changed if the spelling thereof is altered. (b) by any married woman, of her husbands name. 6. Obligations of masters of vessels, etc. (1) The master of any vessel landing or embarking at a port in [India] , passengers coming to or going from that port by sea and the pilot of any aircraft landing or embarking at any place in [India] , passengers coming to or going from that place by air, shall furnish to such person and in such manner as may be prescribed a return giving the prescribed particulars with respect to any passengers or members of the crew, who are foreigners. (2) Any District Magistrate and any Commissioner of Police or, where there is no Commissioner of Police, any Superintendent of Police may, for any purpose connected with the enforcement of this Act or any order made there- under, require the master of any such vessel or the pilot of any such aircraft to furnish such information as may be prescribed in respect of passengers or members of the crew on such vessel or aircraft, as the case may be. (3) Any passenger on such vessel or such aircraft and any member of the crew of such vessel or aircraft shall furnish to the master of the vessel or the pilot of the aircraft, as the case may be, any information required by him for the purpose of furnishing the return referred to in sub-section (1) or for furnishing the information required under sub-section (2). [(4) If any foreigner enters [India] in contravention of any provision of this Act or any order made thereunder, the prescribed authority may, within two months from the date of such entry, direct the master of the vessel or the pilot of the aircraft on which such entry was effected or the owner or the agent of the owner of such vessel or aircraft, to provide, to the satisfaction of the said authority and otherwise than at the expense of Government, accommodation on a vessel or aircraft for the purpose of removing the said foreigner from India. (b) passenger means any person not being a bona fide member of the crew, travelling or seeking to travel on a vessel or aircraft. 7. Obligation of hotel keepers and others to furnish particulars. (1) It shall be the duty of the keeper of any premises whether furnished or unfurnished where lodging or sleeping accommodation is provided for reward, to submit to such person and in such manner such information in respect of foreigners accommodated in such premises, as may be prescribed. Explanation .The information referred to in this sub-section may relate to all or any of the foreigners accommodated at such premises and may be required to be submitted periodically or at any specific time or occasion. (3) The keeper of every such premises shall maintain a record of the information furnished by him under sub-section (1) and of the information obtained by him under sub-section (2) and such record shall be maintained in such manner and preserved for such period as may be prescribed, and shall at all times be open to inspection by any police officer or by a person authorised in this behalf by the District Magistrate. (c) to refuse admission to such premises either to all foreigners or to any specified foreigner or class of foreigners. (2) A person to whom any direction has been given under sub-section (1) shall not, while such direction remains in force, use or permit to be used any other premises for any of the aforesaid purposes, except with the previous permission in writing of the prescribed authority and in accordance with any conditions which that authority may think fit to impose. Provided that where a foreigner acquired a nationality by birth, he shall, except where the Central Government so directs either generally or in a particular case, be deemed to retain that nationality unless he proves to the satisfaction of the said authority that he has subsequently acquired by naturalization or otherwise some other nationality and still recognised as entitled to protection by the Government of the country whose nationality he has so acquired. Provided that the Central Government, either of its own motion or on an application by the foreigner concerned, may revise any such decision. If in any case not falling under section 8 any question arises with reference to this Act or any order made or direction, given thereunder, whether any person is or is not a foreigner of a particular class or description the onus of proving that such person is not a foreigner or is not a foreigner of such particular class or description, as the case may be, shall notwithstanding anything contained in the Indian Evidence Act, 1872 (1 of 1872), lie upon such person. 10. Power to exempt from application of Act . 11. Power to give effect to orders, directions, etc. (1) Any authority empowered by or under or in pursuance of the provisions of this Act to give any direction or to exercise any other power, may, in addition to any other action expressly provided for in this Act, take, or cause to be taken such steps and use, or cause to be used, such force as may, in its opinion, be reasonably necessary for securing compliance with such direction or for preventing or rectifying any breach thereof, or for the effective exercise of such power, as the case may be. (2) Any police officer may take such steps and use such force as may, in his opinion, be reasonably necessary for securing compliance with any order made or direction given under or in pursuance of the provisions of this Act or for preventing or rectifying any breach of such order or direction. (3) The power conferred by this section shall be deemed to confer upon any person acting in exercise thereof a right of access to any land or other property whatsoever. 12. 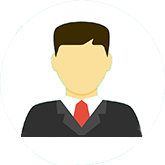 Power to delegate authority. Any authority upon which any power to make or give any direction, consent or permission or to do any other act is conferred by this Act or by any order made thereunder may, unless express provision is made to the contrary, in writing authorise, conditionally or otherwise, any authority subordinate to it to exercise such power on its behalf, and thereupon the said subordinate authority shall, subject to such conditions as may be contained in the authorisation, be deemed to be the authority upon which such power is conferred by or under this Act. 13. Attempts, etc., to contravene the provisions of this Act, etc. (1) Any person who attempts to contravene, or abets or attempts to abet, or does any act preparatory to, in contravention of, the provisions of this Act or of any order made or direction given thereunder, or fails to comply with any direction given in pursuance of any such order, shall be deemed to have contravened the provisions of this Act. (2) Any person who, knowing or having reasonable cause to believe that any other person has contravened the provisions of this Act or of any order made or direction given thereunder, gives that other person any assistance with intent thereby to prevent, hinder or otherwise interfere with his arrest, trial or punishment for the said contravention shall be deemed to have abetted that contravention. (3) The master of any vessel or the pilot of any aircraft, as the case may be, by means of which any foreigner enters or leaves [India] in contravention of any order made under, or direction given in pursuance of, section 3 shall, unless he proves that he exercised all due diligence to prevent the said contravention, be deemed to have contravened this Act. shall be punished with imprisonment for a term which may extend to five years and shall also be liable to fine; and if he has entered into a bond in pursuance of clause (f) of sub-section (2) of section 3, his bond shall be forfeited, and any person bound thereby shall pay the penalty thereof or show cause to the satisfaction of the convicting Court why such penalty should not be paid by him. Explanation .For the purposes of this section, the expression visa shall have the same meaning as assigned to it under the Passport (Entry into India) Rules, 1950 made under the Passport (Entry into India) Act, 1920 (34 of 1920). shall be punished with imprisonment for a term which shall not be less than two years, but may extend to eight years and shall also be liable to fine which shall not be less than ten thousand rupees but may extend to fifty thousand rupees; and if he has entered into a bond in pursuance of clause (f) of sub-section (2) of section 3, his bond shall be forfeited, and any person bound thereby shall pay the penalty thereof, or show cause to the satisfaction of the convicting Court why such penalty should not be paid by him. 14-B. Penalty for using forged passport.Whoever knowingly uses a forged passport for entering into India or remains therein without the authority of law for the time being in force shall be punishable with imprisonment for a term which shall not be less than two years, but may extend to eight years and shall also be liable to fine which shall not be less than ten thousand rupees but may extend to fifty thousand rupees. 14-C. Penalty for abetment.Whoever abets any offence punishable under section 14 or section 14-A or section 14-B shall, if the act abetted is committed in consequence of the abetment, be punished with the punishment provided for the offence. 15. Protection to persons acting under this Act. 16. Application of other laws not barred.The provisions of this Act shall be in addition to, and not in derogation of, the provisions of the Registration of Foreigners Act, 1939 (16 of 1939), [the Indian Passport Act, 1920 (34 of 1920)] and of any other enactment for the time being in force.